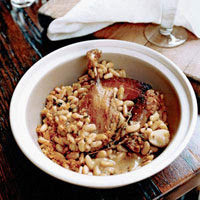 Chef Laurence Jossel created this stripped-down version of the classic French stew, with creamy white beans, luscious store-bought duck confit, smoky French garlic sausage, and slab bacon. Letting the beans rest overnight develops their flavors. In a large saucepan, heat 3 tablespoons of the olive oil. Add the pancetta and cook over moderate heat until the fat has been rendered, about 5 minutes. Add the onion and cook, stirring occasionally, until softened, about 7 minutes. Add the beans, thyme sprigs, water, and stock and bring to a boil. Simmer over low heat, stirring and skimming occasionally, until the beans are al dente, about 1 hour. Add the garlic cloves to the beans and simmer until the garlic and beans are tender, about 15 minutes. Discard the thyme sprigs. Season the beans with salt and let cool to room temperature. Cover and refrigerate the saucepan overnight. Preheat the oven to 350 degrees. Rewarm the beans over moderate heat. Transfer the beans to a large, deep baking dish. Nestle the duck legs, garlic sausage, and bacon into the beans. Bake for about 40 minutes, until the cassoulet is bubbling and all of the meats are hot. Remove from the oven and let rest for 15 minutes. In a skillet, heat the remaining 2 tablespoons of olive oil. Add the bread crumbs and cook over moderately high heat, stirring, until browned and crisp, about 3 minutes. Sprinkle the bread crumbs and the parsley over the cassoulet and serve. The cassoulet can be prepared through Step 3 and refrigerated for up to 2 days. Rewarm before proceeding. This entry was posted on 4:10 PM and is filed under Duck and Goose . You can follow any responses to this entry through the RSS 2.0 feed. You can leave a response, or trackback from your own site.